Hurry! $400 Discount Expires on Friday March 22nd. If you are looking to secure investments, find partners or enter the US OSW supply chain, look no further. USOW19 is the world stage and business development hub for New and Active market players. 1300+ US and international delegates – everyone you want to meet, in one place, for 2 days. 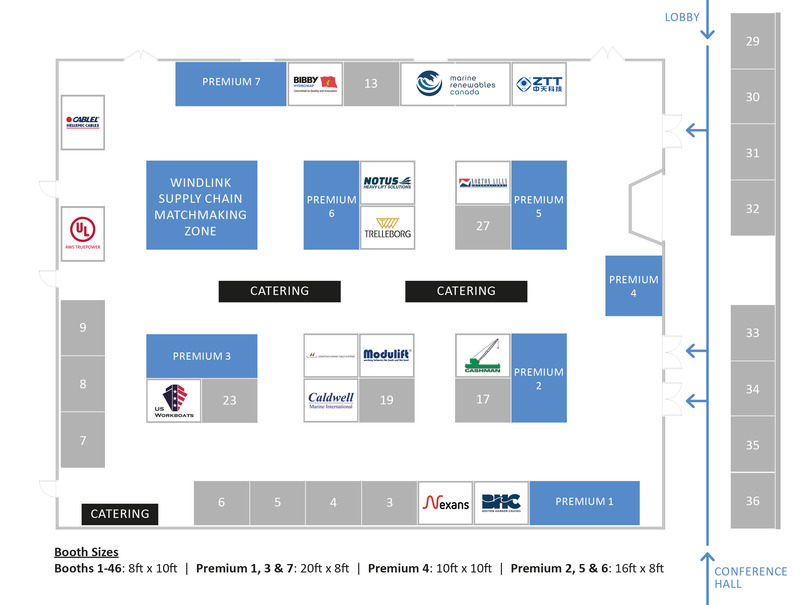 50+ exhibition booths in the USOW19-Expo – network and explore the US OSW supply chain. 80+ speakers across two stages – choose topics that suit your business dev. Goals. 2 x Pre-Conference networking activities in Boston – have fun with your peers! US Offshore Wind Leaders’ Private Dinner – where C-level exec’s meet to share plans and ideas. Market updates from each US State – evaluate markets and where to grow your business. 20+ hours of high-quality networking time with buyers – no other event has more active buyers than USOW19. Ask anyone. 50% of the attendees represent US and European developers – the ideal place for securing investments, contacts and joint ventures. The federal plan for OSW lease areas, upcoming lease auctions, the permitting process and how to work with project stakeholders to help you reduce development risk, prevent project delays and establish industry best practice. Analysis and updates of the US project pipeline, project plans, key dates & supply chain requirements to help you build a competitive market development strategy. Key announcements from local governments, developers and Tier 1 contractors about regulations, policy support, incentives, upcoming projects, and procurement models to help you to secure your place as a developer or supplier. Developer choices for technology, construction, installation and marine logistics, which will inform near-term and long-term plans for supply chain and local content. Detailed comparison of offshore wind electricity markets, procurement frameworks, OREC’s and potential offtakes to help support project development strategies in active and emerging U.S. markets. The USOW19 event is officially the No.1 networking hub for businesses that are looking to invest, find partners or secure contracts in upcoming US offshore wind projects. Anticipating the US offshore wind industry boom, the USOW event has more than doubled in size each year! Now approaching its fourth year, USOW19 will experience another bumper year with no less than 1300 attendees. USOW19 unites 1300+ offshore wind executives, covering everything you need to know about the US offshore wind markets, including two deep-dive breakout sessions on Commercializing Floating Wind Turbines and US Offshore Wind Supply Chain. 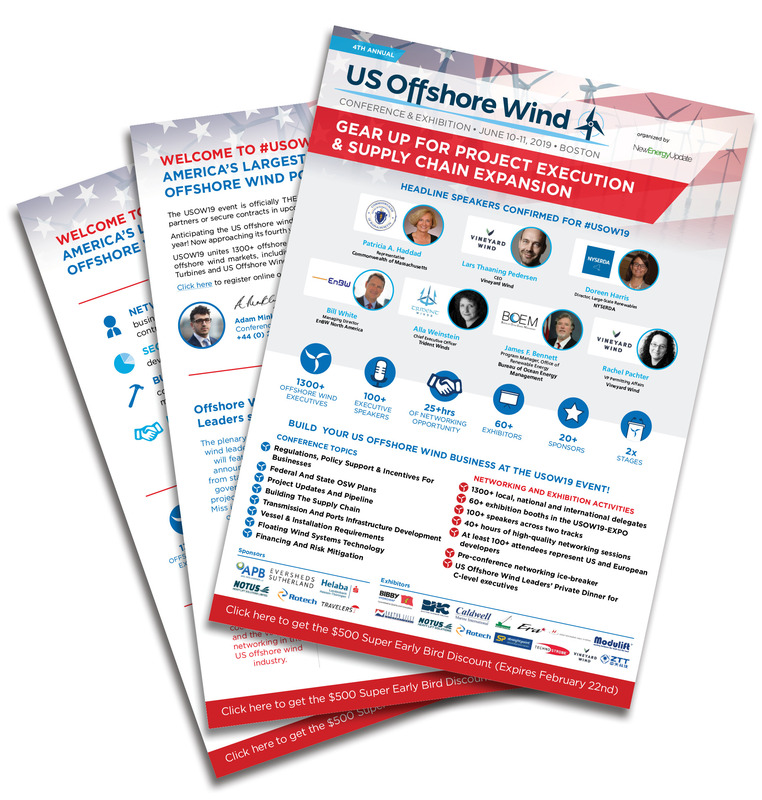 The USOW-EXPO (exhibition) happening alongside the conference hall will accommodate 60+ exhibition booths for companies that wish to sell products and services into the US offshore wind supply chain. Click here if you would like more information about how to book a booth. We strongly advise you to book tickets and hotel in advance because all hotel rooms and conference seats will sell out. New Energy Update is part of FCBI Energy Ltd, Registered in England and Wales - company registered number 09823824 - 7-9 Fashion Street, London, E1 6PX, UK. © 2016 FCBI Energy Ltd. All Rights Reserved.